File Under: things that get you buzzed. Like many folks, you might be a slave to chemical rituals. Caffeine in the morning, and booze at night. In the name of efficiency, Peaks and Pints recommends combining the two at every opportunity. The pairing of roasted barley with roasted coffee is so natural; it’s almost surprising these stouts and porters didn’t catch on sooner. But coffee beers didn’t really start to percolate until the mid-90s, and even now they are far from a staple even among craft breweries. But almost no one argues with the inspiration — porters and stouts tend to rely on a roasty malt bill already, conjuring subtle coffee aromatics and flavors, especially in the finish. If you mean business, and want two buzzes in one (no, they don’t cancel each other out…), then pull up a chair to Craft Beer Crosscut 1.25.19: A Flight of Beer Meets For Coffee. 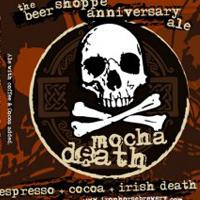 For this seasonal offering, Iron Horse Brewery started with Quilter’s Irish Death, its dark smooth ale that presents a full malt flavor laced with caramel, chocolate, dark fruit, and a touch of sweetness. To this it added fresh, locally roasted espresso beans and pure cocoa. Breathe in the espresso and cinnamon. Taste the creamy, fluffy chocolate, espresso and ice cream with a slight vanilla on the finish. Bowling is a game devised for beer drinkers. You get up, you roll a ball, you sit down. You pound some beers and watch other people do the same. Then you repeat this cycle, all while wearing stupid shoes and knocking stuff down. It’s like beer heaven. 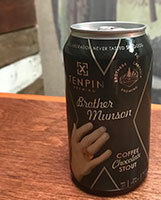 Ten Pin Brewing and Brothers Cascadia Brewing collaborated on two bowling movie-themed beers, including the Kingpin-inspired Brother Munson Stout. In the film, Ernie McCracken (Bill Murray) has a mission in life (other than to roll strikes) to make washed-up bowler Roy Munson’s (Woody Harrelson) life miserable, started by a double-cross that leaves Munson’s hand mangled in a bowling-ball return device. While Kingpin is entirely mean-spirited, Brother Munson isn’t. It’s lovely. The creamy, complex stout strikes a balance between sweet and roasty with Eastern Washington roasted coffee, roasted barley, cocoa nibs, and Cholaca (liquid cacao). Ten Pin Brewing and Brothers Cascadia Brewing bowled/brewed a second game/craft beer. … The Coen Brothers’ The Big Lebowski film became a cultural touchstone in ways that Raising Arizona, Miller’s Crossing, or, say, O Brother, Where Art Thou? could only dream of. Or have nightmares about. 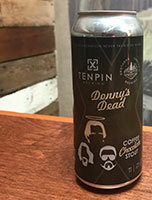 We mean, hell, there are Lebowski Fests in a dozen cities and Ten Pin and Brothers Cascadia teamed up again on their own Lebowski-themed winter libation, Donny’s Dead. Who’s Donny? In the film, Theodore Donald Kerabatsos, aka Donny (played by Steve Buscemi), is a friend of The Dude and Walter. Donny dies of a heart attack, where as a result, we learn that his friends The Dude and Walter don’t know much about Donny. Friends Ten Pin Brewing and Brothers Cascadia Brewing might not know a lot about Donny either (they probably do), but they do know a lot about brewing a coffee chocolate stout. Roasted barley, big chocolate addition and roasted coffee beans from Relevant coffee give this creamy stout a big chocolate aroma and equally big coffee bean taste. Launched in 2015, Hotbox Roasters was brewed up by Oskar Blues Brewery’s founder and craft beer canning innovator Dale Katechis after he bought and learned how to roast on a small roaster as a hobby in the back of the Longmont, Colorado, brewery. Hotbox Coffee Porter features cold-extracted coffee from Burundian and Ethiopian beans. The beans are roasted and the coffee is brewed for 24 hours with cold, crisp, filtered Rocky Mountain water. During the brewing process millions of smooth, velvety nitrogen bubbles are infused into the high-octane brew. Afterward, Oskar Blues’ base porter takes on flavors and aromas of dark plums, chocolate and hints of blueberry. Crashing in with an ABV of 12 percent, AleSmith Brewing’s Speedway Stout goes a step farther than most coffee-flavored stouts and porters (which derive their flavor from roasted malts) and includes an unspecified amount of ground coffee in the brewing process. The result is an intimidatingly dark beer that pours smoothly, leaves very little head, and is surprisingly light and easy to drink. The coffee flavor dominates: the beer is reminiscent of a freshly brewed iced coffee with hints of chocolate and caramel. It finishes with just a tinge of alcohol, which helps to cut the richness of the flavor and leaves you feeling warm, though whether that’s because of the alcohol or the coffee, we’re not sure.